Ground Source and Air Source Sanitiser & Biocide Fluid by Sentinel from the PlumbNation renewable energy collection. Sentinel R700 Ground Source Sanitiser & Biocide 1 Ltr is designed for For Ground Source and Air Source Heat Pumps and will help to eliminate issues caused by bacteria and fungi, available at PlumbNation Plumbing Supplies. 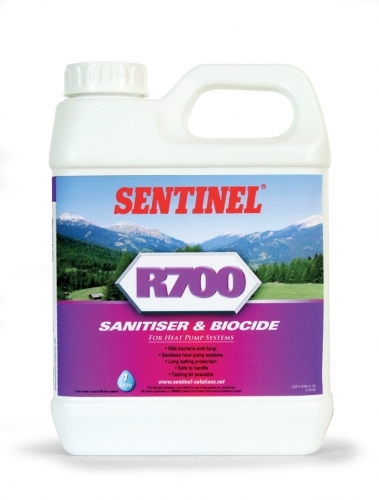 Sentinel R700 is a clear solution containing a stabilised biocide for use in the heat collector circuit of Ground Source or Air Source Heat Pump Systems. These systems can suffer from problems caused by the growth of organisms such as bacteria and fungi, typically: degradation of thermal fluids, blockages of the pipe work, manifolds, valves and heat exchangers, unpleasant smells and corrosion of heat exchangers and manifolds. These problems can severely disrupt the smooth and efficient operation of the heat pump system. Only one litre dose is required for a typical 300 litre system.